I am struck by the difference in tone between the two conventions– at least as it appears during setup week. I noticed the difference when I arrived in St. Paul on Tuesday. The amount of activity in and around the Xcel Center appeared to be significantly less. The scale of the preparations– both by the party and by the media outlets– seems smaller. Today as I was leaving the site I commented that it was almost as if the St. Paul schedule was a day or more behind the schedule in Denver. From our point of view, we began a day later in St. Paul than we did in Denver and are finding ourselves ahead of schedule. We have a light day of work ahead of us tomorrow, and barring catastrophe should be good to start production any time after that. Complications have been minimal and efficiently remediated. We took the opportunity of being ahead of schedule to enjoy a bit of the city. We learned, by way of the Los Angeles Times Atlanta bureau chief that St. Paul has a thriving Vietnamese population. And not long thereafter I found a highly recommended place for phở, a traditional Vietnamese rice noodle soup that I have grown to love since my colleagues at Midway introduced me to it three years ago. With a bit of assistance from Jim, we coaxed the team to come with us and try Vietnamese cooking. This began our short tour of Frogtown. Frogtown is the heart of St. Paul’s Asian community. The phở was authentic and delicious. After lunch we ran an errand that took us to the old money historic section of St. Paul that lines the appropriately-named Grand Avenue. Large Victorian homes line the streets. Eclectic and upscale shops lined the streets and some signs of potential nightlife put this section of town on our collective radar. The downtown of St. Paul has been surprisingly quiet in that respect, so far. After spending the afternoon finishing up the installations in the writing press stands, Tony and I took a tour of the Xcel Center to get a few pictures, and then went back to the hotel to drop off our computers and other non-essentials before heading back out into the city of St. Paul to get some photographs. I had wanted to take a picture of the historic Fitzgerald Theater. 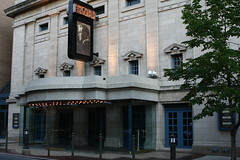 The Fitzgerald Theater is the oldest existing stage venue in the city of St. Paul, and the home of Garrison Keillor’s A Prairie Home Companion. 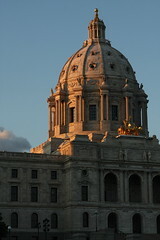 The dusk light was quickly disappearing as we made our way up to the Minnesota State Capitol building and then over to the Cathedral of Saint Paul. I got a few shots of each location before the light failed us entirely. I did not bring my tripod with me to do some long exposures. And more than that I did not have a lot of time for photography as I wanted to get back to the hotel in time to see Barack Obama’s acceptance speech at Mile High Stadium. With the Democratic Convention concluded, and just three days remaining before the Republican Convention begins, I will be curious to see if the pace in St. Paul picks up as dramatically as it did in Denver.